Wooden Toy Horse | Holiday Ponies Figurines | One Price Low Flat Shipping! 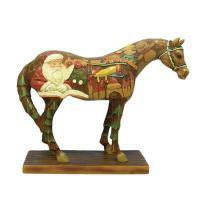 From the Trail of Painted Ponies Collection, Wooden Toy Horse. Designed by artist, Johanna Enriquez. Made of hand-painted resin. Measures 6" tall. This delightful Holiday Pony captures a classic Christmas moment of a jolly Santa sitting at a table in his cozy house at the North Pole, reviewing his naughty or nice list, checking it twice, and from time to time letting out a "Ho, ho, ho!" as images of children's wishes - toy trains, biplanes, dolls and cars - fill his head.